DAMASCUS, Syria (AP) — A top Syrian official urged the opposition to let go of its dream of easing President Bashar Assad out of power in a transitional government, complicating peace talks that resumed Wednesday in Geneva on ending the five-year civil war. A transitional government is the centerpiece of the peace program that the United States, Russia and other world powers agreed on at a 2012 Geneva Conference. The terms have been left vague intentionally and are supposed to be worked out in the peace talks, but the presumption, at least in the opposition’s mind, is that a transitional government means one without Assad. “This will not happen, not now, nor tomorrow nor ever,” Mekdad said, speaking at his office in Damascus ahead of the resumption of the indirect talks in Geneva that the U.N. envoy says will focus on a political transition. Assad recently floated the idea of a national unity government, rejecting the opposition’s demand for a transitional ruling body, and Mekdad echoed the rejection. He said most of the world except Saudi Arabia and Turkey — the two top backers of the rebellion — have all but relinquished calls for Assad to step down, having realized after five years of war that the president is fighting “terrorists” in Syria. Aided by Russian air power, the Syrian army and allied militiamen have reversed the tide of the war in recent months, making rapid advances against its opponents. Syria also has benefited from a U.S.- and Russian-engineered partial cease-fire, which has allowed it to focus on fighting extremists like the Islamic State group and the Nusra Front, which are excluded from the truce agreement. However, a recent surge of fighting in northern Syria is making that truce increasingly shaky. The new 250-member parliament being chosen Wednesday is expected to serve as a rubber stamp for Assad. Western leaders and members of Syria’s opposition have denounced the election as illegitimate and a provocation that undermines the peace talks. After casting his vote with his wife, Asma, Assad said the election was one way to defy the terrorists — the term he uses to describe Syria’s armed opposition. Parliamentary elections in Syria are held every four years, and Damascus says the vote is constitutional and separate from the Geneva talks. But the opposition says the voting contributes to an unfavorable climate for negotiations. Britain said Damascus’ decision to go ahead with the elections in the war-torn nation, where hundreds of thousands cannot take part, shows “how divorced (the government) is from reality.” Germany said it would not accept the results of the vote. Assad’s main ally, Russia, welcomed the vote, calling it necessary to prevent “a power vacuum” in Syria until a new constitution and elections are agreed upon in the peace talks. In the tightly-controlled Syrian capital, voters said they fully supported holding the elections. “My vote is like a bullet to our enemies. I am here to continue the ongoing resistance since five years. I am here to support the Syrian Arab Army,” said 18-year high school student Yazan Fahes, holding up an ink-stained finger. Most voters said they were mostly concerned about skyrocketing prices rather than security, which has become less of a concern in the capital since the cease-fire. Marah Hammoud, a 21-year-old journalism student from the central city of Homs, said it was important at this moment in Syria for people to choose their representatives. The balloting, in which soldiers are being allowed to vote for the first time, was carried out only in areas under government control. 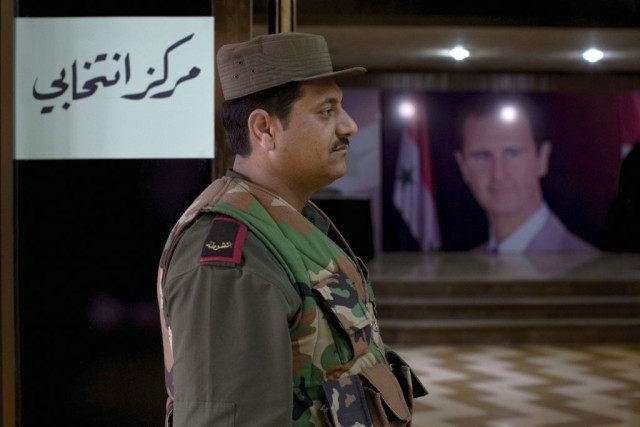 Voting stations were set up in 12 of Syria’s 14 provinces. The northern province of Raqqa is controlled by the Islamic State group, and the northwestern province of Idlib is controlled by its rival, the al-Qaida-affiliated Nusra Front, as well as other insurgents. The government has no presence in either province. While some parts of Damascus had sizable turnout, other less-secure areas on the outskirts of the capital and on the edge of rebel-held suburbs saw fewer people vote. In Tadamon, outside the Palestinian refugee camps of Yarmouk, which is largely under IS control, people were hesitant to vote, and polling centers were nearly empty for most of the morning despite the military presence. Polls were to close at midnight, after they were extended for five hours because of high turnout, according to state TV. Results were expected Thursday. The peace talks resumed in Geneva with U.N. special envoy Staffan de Mistura hosting a delegation from the main opposition group, the High Negotiations Committee. A delegation from Assad’s government is expected to arrive later this week. The two sides do not negotiate directly in the “proximity” talks; instead, de Mistura meets with each side separately and shuttles between them. In Turkey, a local news agency said shells fired from Syria hit a southern Turkish area Wednesday, the fourth such cross-border incident in less than a week. The private Dogan news agency said the shells struck two areas of the city center of Kilis, causing panic despite hitting vacant land and causing no casualties. Turkey routinely retaliates after rockets or shells land on its territory. Associated Press writer Dominique Soguel in Istanbul, Sarah El Deeb in Cairo and Maeva Bambuck in Damascus, Syria, contributed to this report.